Pure Jongo review | What Hi-Fi? Pure’s Jongo multi-room system was among the first to take on Sonos, but at a more affordable price. Now in its second year, the Jongo has grown up a little, losing the colourful grilles for a simpler, more understated design and - with a major audio update - it’s now arguably at its best thus far. Following the set-up instructions with each Jongo speaker is easy: you need one master speaker on your wi-fi network first (using a set-up page) and the remainder can be added by holding down a button for a few seconds. This is Sonos levels of simplicity, and we’re impressed. The Jongo family is reasonably well stocked, offering four sizes of speaker - one of which is portable. Best of all are the prices. A recent price cut means it’s £80 for the smallest T2 speaker, going up to £180 for the T6. A two-room set-up, therefore, can cost as little as £160. Speaker control is via the Pure Connect app, which is also the home for Pure’s own streaming service. You’re not obliged to use the service, but it does stand in the way of control just a little if you’re not a paid-up subscriber. If you’re considering buying into the Jongo system, it’s worth giving the one-month trial a go – we find the store well stocked and it offers a more seamless experience with Jongo than other streaming services. Within the Pure Connect app you’ll be able to control your speakers – edit their names, control grouping, tweak EQ settings, volume and so on. As for music control, you’ll only be able to stream music either via Pure Connect (subscription required) or content stored locally on your device or home network. If you want to use another streaming service (such as Spotify), you have to turn on the Bluetooth Caskeid setting within the app – a feature that allows for multi-speaker streaming over Bluetooth. This means selecting the speakers you want to use within Pure’s app, heading to your phone’s Bluetooth pairing menu and selecting any one of the Jongo speakers showing. They will then push the music to any of the other speakers you selected automatically. It’s not as straightforward as streaming over wi-fi from Pure’s app (you must move back and forth between your streaming app and Pure’s to control your speakers, for example), plus you can’t choose to stream different music to different speakers. It’s limiting when compared to rival systems. We’re also unsure how this would work in a large house, considering the range limitations of Bluetooth. Streaming Ella Eyre’s If I Go from Pure Connect shows the Jongo system is not short on big, powerful sound. 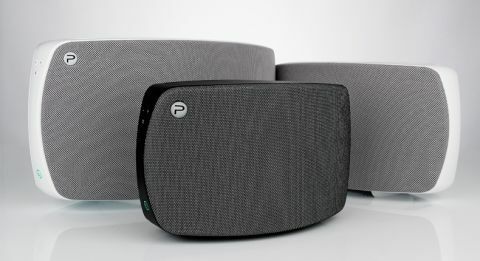 No matter which speaker you choose, they’re capable of a sound that outstretches their physical size; the T6 fitting the bill for filling the bigger rooms. We reach for the EQ settings with most of the speakers to take the bass down a notch or two – there’s a little more refinement needed here, and bass can sound heavy-handed. The low-end has a weighty punch to it, which can work well with some music, but more delicate tunes need a softer approach. There’s a decent level of detail here, but it’s not the last word in clarity - particularly in the midrange. Treble, for the most part, stays on the right side of bright, which gives the Pure an up-front character. Push the volume and it can start to sound harsh, though. Overall, the sound is energetic and listenable with everything we throw at it, from John Legend to Metallica. Pure has hit the spot with the Jongo system. It can’t match Sonos and Samsung for out-and-out sound quality, but its price means multi-room is an option for more people than ever before.